If PR falls to a bad client, does it make a difference? I’ve often told anyone who will listen in PR, if you want this career to feel less like a job — find the causes behind the clients. It gives you purpose. It gives your battle through traffic every morning a meaning. And it gives you the steam you need to keep going. That said, I don’t see how in the world Allan Ripp can do that with his new client, one slimy troll named Martin Shkreli who made news (and this nation’s “most hated” list) earlier this month. Shkreli is a former hedge-fund manager and founder of Turing Pharmaceuticals, whose claim to fame is spiking Daraprim — a drug that treats a rare infection with those battling HIV/AIDS — more than 4,000 percent. 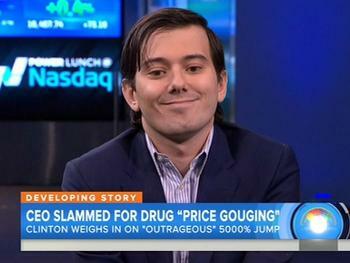 From $18 to $750 a pill, all because the “pharma bro” could. One can imagine that nasty headline would give this classy fellow a few image issues, so he searched across the country for PR representation. And he found Ripp who, according to a story in the Washington Post, has questioned this cause because of that client. “Turing’s leaders are dedicated for development of life-saving drugs, investment in research to improve their formulation and treatment of a wider population of patients,” Ripp said. That development may be what they do, but unless Ripp performs a PR miracle, we all know what they are dedicated to do at Turing, as long as Shkreli is at the helm. And it has nothing to do with research.